May 2-5: Silver Lake Campout, Firehouse, Silver Lake OR. Click here for more info. Jun 13-15: High Desert Jamboree, Harney County Fairgrounds,Burns OR. Click here for more info. Jul 22-25: Fiddle Camp, East Linn Christian Academy, Lebanon OR. Click poster or Fiddle Camp Website for more info. Aug 15-17: Winchester Bay Campout, Winchester Bay Community Center. Check the OOTFA Event Calendar for other events of interest. Use the "agenda" view for best results. Read the latest Hoedowner for additional state and district info. The About Us tab provides information about our association and its history. The OOTFA Event Calendar tab provides time and place information for OOTFA events as well as related oldtime festivals. The OOTFA board meets quarterly at various locations around the state. Each meeting includes jamming, workshops, dinner and a performance. Other events are the OOTFA State Convention held at the Polk County Fairgrounds in Rickreall each April, the Oregon Fiddle Contests held each March at Chemeketa Community College in Salem, and the Willamette Valley Fiddle Contest held each August at the Benton County Fairgrounds. The Contact OOTFA tab provides postal addresses, phone numbers, and email addresses for each of the state officers. To contact your district officers, refer to the current issue of The Hoedowner. At the top of each district's news entry is a list of district officers along with their postal addresses, phone numbers, and email addresses. Lew Holt's Posts tab will give you access to Lew's news and views of current and past activities in our organization. Lew is a past president of OOTFA and editor emeritus of The Hoedowner, our monthly newsletter. The Hoedowner Archive tab provides access to all issues of our monthly newsletter. The Current Issue gives you up-to-date info on what's happening at the state level and in the various districts of Oregon Oldtime Fiddlers. It also includes contact information for the various state and district officers. The Join OOTFA tab will tell you more about our organization and how you can join us. The Donate to OOTFA tab will provide information on how you can support our organization. The OOTFA Forms tab provides access to various OOTFA nomination, request, order, and application forms. 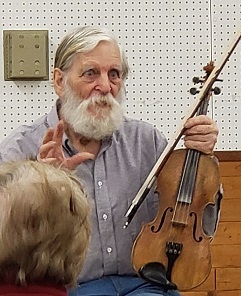 Truman Price held forth on the historical influences on oldtime music at the 2019 OOTFA convention in Rickreall.